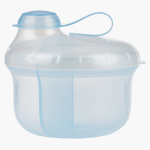 Nuby Milk Powder Dispenser | Blue | Easy and convinient . Convenient and compact, this milk powder dispenser is certainly a must-have. This BPA-free dispenser has a lid that prevents the powder from spilling. Feature 1 : Easy and convinient . Feature 2 : Compact Size.